In the middle of a long night, Lesley Martin took her dying mother in her arms, pulled a pillow across her face and hugged her tightly until she stopped breathing. The decision to end her mother’s life came after what had been a harrowing journey for the 36 year old nurse. When her mother Joy was diagnosed with bowel cancer, Lesley chose to quit her job and take care of her. 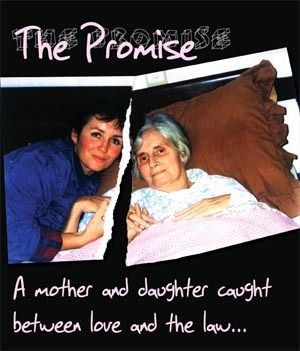 During the time they spent together, Joy asked Lesley to make a promise. She asked her daughter to help her when it was “time”, and to make it quick. In 2004 Lesley Martin stood trial for attempting to murder her mother. She became a focal point for the international voluntary euthanasia debate. “The Promise” is her story. More on Screen background over here. Official Selection – INPUT 2006 – Taiwan. Best of Festival. Watch a video excerpt from The Promise Television, 2005 NZ Onscreen if either video embedded below isn’t viewable on your browser or device.